In January 2019, the Cape Verde Government have given a 30 day tourist visa exemption to European and some other nationals entering Cape Verde. However, at the same time as this, a new TSA Airport Security tax was introduced. There will be some people that will be exempt from paying this new TSA tax, however, there are still some expats that are unsure as to whether other visa's, other than the Residence Visa, will allow them to be excluded from paying TSA tax as some have already had to pay the TSA on entry, while others not!. Please check for up to date travel and visa or TSA information on your Embassy website, before booking your trip to Cape Verde. All incoming international flight passengers will disembark from the plane and enter the terminal for arrivals. If you have a pre-paid visa on a package holiday and on an international flight you will join the queue to be processed by Passport Control officers at any of the counters. On entering the terminal building on Sal Island, at Amilcar Cabral airport, one counter/desk is at this time currently for payment of visa/TSA. Please note: Non-Europeean passport holders of other nationalities may still need a Visa, as will all others that are not exempt. We do not provide answers to who is exempt, as sometimes categories are a bit vague and we are not the right people to ask, please contact your Embassy or the Cape Verde Embassy in Brussels if your Tour Operator/Travel Agent cannot advise you. If you are from a country or of a nationality where you need a visa to enter Cape Verde, you may need to pay in advance for a visa or TSA tax. Some tour operators may include this in the flight or package holiday price (you need to check before you fly). If you are told to go to the designated Visa/TSA payment desk, the current cost for an Entry Visa is 25 Euros (Euro cash notes only) and for this you will be given a visa receipt showing the date you entered CV, amount paid and stating that the visa is valid for 30 days. However, please check before flying as some foreign nationals may require you to be issued with a visa before departing on a flight and arriving in Cape Verde! When you enter the airport after arriving on Sal, once inside the building go to the Visa/TSA payment desk along the far side of the row of counters (on the left). Go to the desk and give the officer your passport and payment in Euros (they will not accept sterling/dollars or other denominations and you have to pay with Euro notes, not coins). Then once he/she has given you your payment slip and returned you passport to you, you should be allowed straight through into the luggage collection area. If you have pre-paid or pre-arranged a visa with a tour operator and they tell you at arrivals at Passport Control that your name is not on their system as having pre-paid, you may be asked to pay 31 euros TSA tax (per adult). NOTE: Keep your receipt to try and claim the money back at the end of the holiday. If you don't have euros you will have to obtain some through the Bank or the Cash Point. Please note the Bank could be closed when you arrive but Customs will let you through to get the cash from the Bank or ATM to make the Euro or Cape Verde Escudo (CVE) cash payment. If you have to pay for your visa you can only pay with euros or CVE. Most tourists will be arriving in Cape Verde for the first time and therefor will not have any Cape Verde escudos, so they should pay in euros. You will also need euros or escudos to pay for taxis and to buy things in shops. NOTE: They only change sterling or American dollars at the banks. Some smaller Cape Verde islands do not accept euros in the shops (only at the bank). Also note, you don't need to buy Cape Verdean escudos from any online sellers before you arrive, if you do, you will normally be paying over their actual value! An Immigrants Guide was produced by the Camara Municipal on Sal Island in 2012 which provides a lot of useful information. 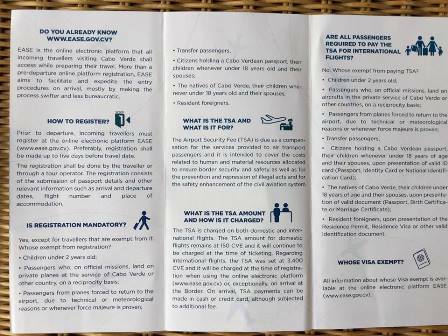 Please see page 10 of the guide which is about visas. Click on the link below, but PLEASE NOTE that the Guide Book refers to Tourist Visa being for 90 days (which is not correct), on entry to Cape Verde a tourist entry visa is only for 30 days! NOTE: Since 2nd January 2019 some holders had to pay TSA on entry while others didn't..........we await an update. If you are expecting to return to CV a number of times during the year, then make enquiries about the Multi- Entry Visa. In the UK this can be done by contacting the Honorary Consulate in London, they will provide you with more information about this type of visa and costs. Generally this visa allows you to stay in Cape Verde for up to 90 days. Some people may leave Cape Verde on the 89th day for a short break to another country and re- enter Cape Verde a week or so later, others may choose to use this visa to visit CV a number of times for shorter periods. Jonathan Lux at the London Office can advise on this. NOTE: Since 2nd January 2019 ..........requirements regarding TSA for 6 month visa holders are not clear. A number of British Nationals may choose to visit the Cape Verde Embassy or Consulate in Lisbon or Gran Canaria to get a 6 month visa before flying onto Cape Verde. They contact the Cape Verde Consul/Embassy they wish to visit before booking their flight to make sure the Embassy will be open on the day they wish to visit, as they close on National Holidays etc and on weekends, or maybe before the flight arrives, so even though you have checked on the website for opening times, email them before arriving to ask them if they will be open and how long it will take for your visa to be processed. If your flight is due to land in Lisbon early enough and you think you have enough time to go and process this visa in one day before flying onto CV later that evening, remember, there could be a flight delay in the morning or flight cancellation! If you have an onward flight to Cape Verde the same day, you may not be able to process your visa. 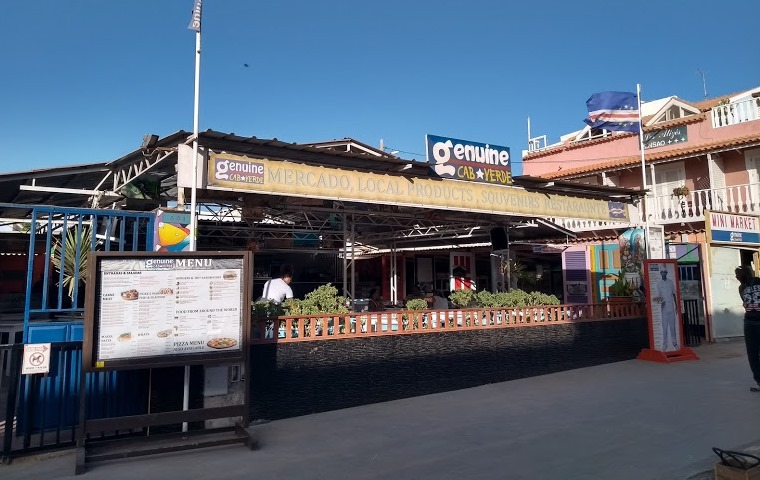 Some British Expats living in Cape Verde may combine a visa run with having a holiday break on Gran Canaria and doing some shopping in Las Palmas at the same time. Non UK citizens should make their own enquiries with their nearest Cape Verde Consulate or Embassy about entry visa's. Cape Verde Tips does not provide a service for issueing Visa's. There are Cape Verde Embassies in other countries at which you can apply for visa's. In 2015 the rules changed. Previously a Residencia visa was for 12 months and could only be applied for in Cape Verde. However they have now reduced this to a 6 month visa. If you have already had a number of 6 month visa's in your passport up to 2015, the Police will tell you that if you intend living in CV you need to apply for your Residence Card. If applying for this visa, the list of documents you need to provide is between 10-15 items, most with cost implications. If you want to apply in person in Cape Verde to extend your visa at a National Police station, on some islands the process will not be as quick as if you did this in person at the Frontier Police Office in Praia on the capital island of Santiago. Some of the documents you may need to extend your visa on the island you are staying on can include:A Police Disclosure form from the UK, proof of earnings or that you are able to sustain yourself financially while in CV (bank account).If you are using a CV bank to show proof of funds,tell the bank clerk that you need it for your visa application as this is different to a bank statement; a rental contract if you are renting an apartment, or, proof of ownership of a property.All info needs to be provided in Portuguese so you will need English docs translated and notarised. On your application you may request a 6 month extension, however, they may issue you with a 3 month visa initially. There are some costs involved with getting some documents. Then there is the cost of the visa each time, which I think is around 50 euros.